Because I´m very interested in working with conductors and orchestras, I have many concert pieces in my repertoire. I performed the European première of the Danzón Nr. 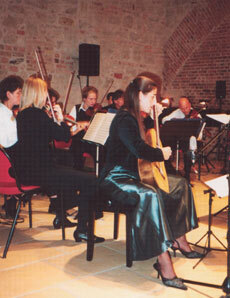 3 for Guitar and Chamber Orchestra by the Mexican composer Arturo Márquez (November 30, 2000 at the Otto-Braun-Saal in Berlin). 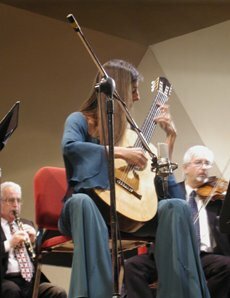 I also played the piece for the opening of the "Mexartes-Berlin" festival at Haus der Kulturen der Welt (12/12/01) and at the closing concert from "Encuentro de la Guitarra" with the SODRE-Orchestra under Nicolás Rauss in Montevideo, Uruguay. View film. I played the "Fantasía para un Gentilhombre" by J. Rodrigo and "Musique de Cour" by A. Tansman with the Berlin-Sinfonietta Orchestra for the 15th Spandauer Gitarrenfest.